I was trying to figure out how to tackle what looks to post because everyone has different coloured dresses and different styles etc. I decided that I would use pieces of jewellery as inspiration so I hope you like what I come up with! The first look is a bronze smokey eye with a pop of teal. It’s based around these earrings I bought to wear to one of my friends weddings recently. I actually wore a very similar EOTD to the one I’m posting todayto her wedding except today’s EOTD utilises drug store brands. I wanted to focus on drug store brands because I know that most high schoolers can’t afford to pay for higher end brands. The main brand I used was NYX and the lid colours are some loose pigments by NYX, specifically their Ultra Pearl Mania pigments. I really love these because the colours are really beautiful and the texture is quite lovely. The only thing that annoys me about this product is the fact that the opening of the bottle is really small so a standard size brush (MAC 239) won’t fit in there and you also can’t easily tap product out onto the lid. I also used a NYX eyeshadow trio. I’ve only tried one trio which I bought based on rave reviews but so far I’m disappointed with the quality. 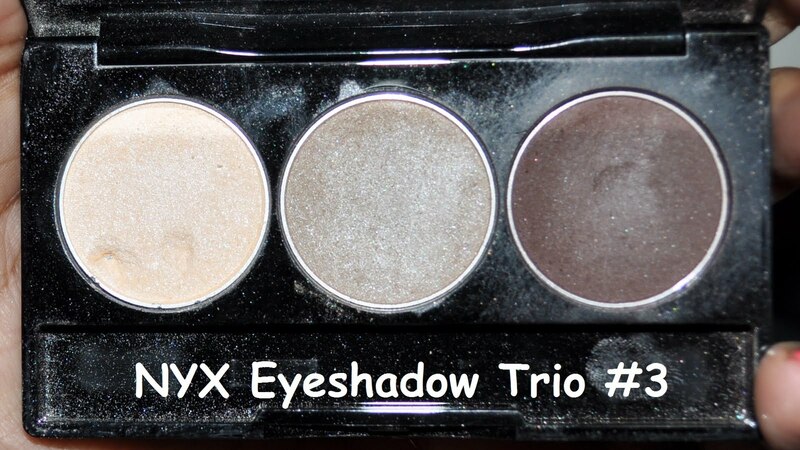 This particular trio is not very pigmented and is quite chalky and hard to work with. I always use these on top of a base or they look very unimpressive. NYX Jumbo eye pencil in Dark Brown on the lid just up to the crease and avoiding the inner most part of the lid. I also cut some Ardell Wispies false lashes in half and applied one half to each eye on the outer half of my top lashline. This look is so easy to do and you can easily change it up by changing the coloured liner on the bottom or by just sticking with black for a more traditional smokey eye. That is sooo pretty!! I really wanna try the color liner on water line thing. I like how it really ties into the look. Great for prom! Ki: Thanks! You should try it with a rusty orange type liner or shadow as well because they go really well together. Good luck with your interviews! Job searching is so draining but hopefully you won't be looking for long :)Aseya: Thank you 🙂 You should definitely try it because it's the easiest way to introduce colour into even the most neutral eye looks.Widdlesh: Thanks so much :DDempss01: Thanks! I love bronzes and gold paired with teal. I keep meaning to use my other coloured liners but I always go back to the teals and aquas!